Tight Rope - You can walk across it, but you cannot land on it. There is a tutorial at the beginning of the game. 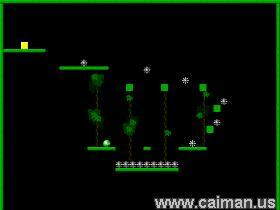 When you finish it, you will have all the necessary skills to complete all the levels, but it still won't be easy! The music is good and the sound effects are relly neet. Don't go looking for options because there aren't any. At the beginning title screen you can load a game and start at any level which you have previously played and you can get help. There is no pause during the game but that would not be useful. This game tests you hand/eye coordination to the limits. The timing doing certain stunts is very critical and then of course when you start the level you must plan on exactly how you are going to complete it. 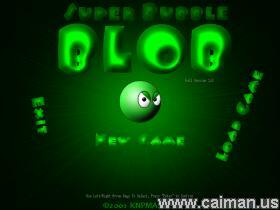 All in all Super Bubble Blob is a fun and addicting game to play. Direct DOWNLOAD from authors site (exe - install) 3,54 MB.